An action group is threatening to stage a mass blockade of the Scottish Parliament if a cash commitment is not given to fund a permanent fix of the A83. As the Rest and Be Thankful section of the route remained closed yesterday awaiting work on the latest landslide, the Argyll First group demanded a permanent solution. 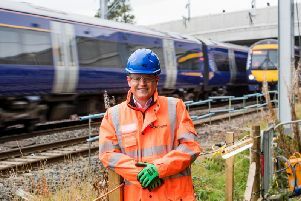 He claimed viable solutions were available but had been turned down by the Scottish Government on cost grounds, but added: “It’s no use saying they are going to tinker with this and that, we want a permanent solution, like a flyover or a tunnel, and if we don’t get this we will move to the next stage, we will need to take further action and that may include blockading the Scottish Parliament. Explaining the disastrous effect the A83’s repeated closures have, Mr Kelly said: “It’s just one section of road that is impacting on the lives of the people of Argyll and Bute, we need it to get to hospital visits, It’s vital to the tourism industry, for the wood lorries and the wind power industry. “The impact on hauliers is bad, as everything that comes in here, from the newspapers to the bread – all the basics staples – they use that road. “It’s a vital artery, the traffic needs to flow, but they are strangling it. How committed are the Scottish Government to rural areas? It just seems to be lip service they give to rural communities. A Transport Scotland spokesman said the taskforce will reconvene on November 15 to consider further options as soon as possible. The spokesman said a study in 2013 considered two tunnels and a new route on the opposite hillside, with an upper estimate of about £90 million.